After the 2016 U.S. election, the prospects for digital rights under the incoming administration seemed particularly grim. A silver lining in this dark cloud has been the concerted efforts we’ve seen by groups working to defend digital rights at the local level. Over the past year, a growing network of grassroots groups, the Electronic Frontier Alliance, has taken substantial steps forward in protecting online civil liberties in dozens of communities across the U.S.
Our preliminary concerns about the Trump administration’s attacks on digital rights unfortunately proved valid. President Trump inherited a surveillance apparatus that threatened privacy in a number of ways, from warrantless surveillance of Americans’ electronic communications to monitoring the social media accounts of immigrants, including naturalized U.S. citizens. The administration’s escalating attacks on other digital rights came quickly, with various departments targeting access to knowledge by removing publicly funded research from the web and issuing unconstitutional subpoenas to web hosts seeking the identities of visitors to websites used to coordinate protests of the Trump administration. Less than a year into the new administration, free expression is under threat in Congress in the form of bills like SESTA that would likely push marginalized voices offline. But through the EFA, groups are working together to educate communities and bring about change at the grassroots level. 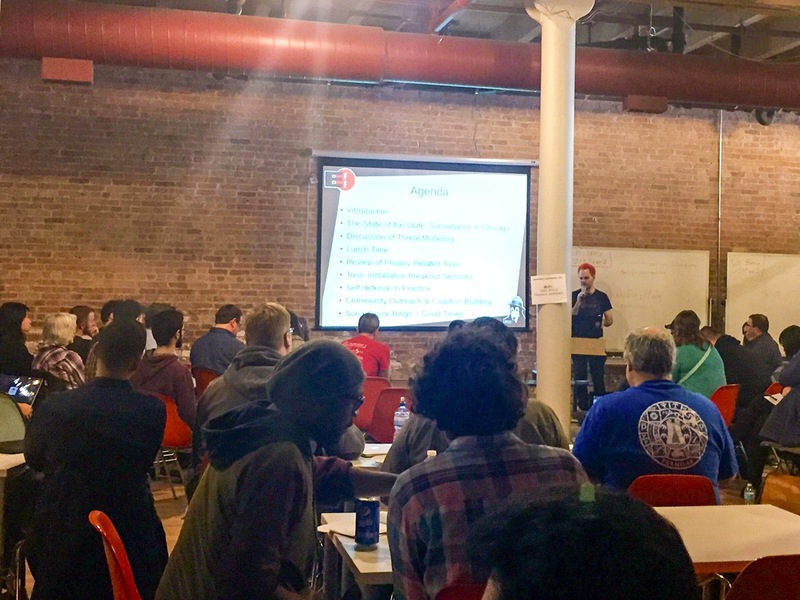 The Alliance has served as a national hub for local activism that addresses a spectrum of civil liberties and digital rights issues, by bringing together groups pursuing a range of strategies and tactics—from hacker spaces facilitating the open source development of software tools, to student groups hosting teach-ins and documentary screenings, to community coalitions activated by concerns about affronts to digital rights. Across the political spectrum, these groups are coming together to champion the EFA's uniting principles: privacy, creativity, free expression, security, and access to the intellectual commons. A community group in Providence, Rhode Island Rights, helped establish the nation’s strongest local civil rights and civil liberties policy. Included within the law they helped secure are protections and reforms for individuals included in gang databases, requirements for police to establish reasonable suspicion of criminal activity before targeting individuals with electronic surveillance, and protecting the civilian right to observe and record police activities. On the other side of the country in California, Oakland Privacy was originally born from the Occupy movement and more recently spearheaded continuing policy advocacy in half a dozen jurisdictions across the Bay Area addressing law enforcement surveillance. In Oakland and Berkeley, we anticipate upcoming votes by local legislative bodies on proposals to require community control over the acquisition and deployment of surveillance technologies by local police. Another Bay Area community group, Citizens Rise in Redwood City, reached out to their state senator to support SB 21, a proposed statewide measure that would subject police surveillance to local oversight by elected officials. Unfortunately, after being approved by the California Senate, the bill stalled in the Assembly’s appropriations committee. Their engagement, however, ensured the bill’s integrity and prevented it from being replaced with a weaker bill that could have limited future policy opportunities in other jurisdictions. A community group in Chicago, Lucy Parsons Labs, played a key role through public records requests in raising awareness about Stingrays, which helped the push for state reforms that set a national high watermark for restrictions on these and other cell site simulators. The group also recently paired with another local Chicago area group in the EFA, the Chicago Committee to Defend the Bill of Rights, to host a Surveillance Self-Defense training that served as one of the first pilots of EFF’s new Security Education Companion materials, which provide teaching best practices to facilitators and trainers. Another mid-western community group, Privacy Watch St. Louis, has organized a coalition supporting proposed Board Bill 66, which (like SB 21 in California or the measures championed by Oakland Privacy) would require city agencies to seek approval from the city’s Board of Alders before adopting new surveillance equipment. In addition to canvassing neighborhoods and reaching out directly to members of the Board to garner support, Privacy Watch has also supported community education efforts. Recently, the coalition hosted an event at the headquarters of the Organization for Black Struggle, a force in the community since 1980, that drew connections between the history of COINTELPRO and current experiences with federal and local police surveillance. The Journal of Law and Technology at Texas (JOLTT) is a registered student organization at the University of Texas-Austin whose goal is to spark discourse among staff and students on complex issues at the intersection of law and technology. They recently hosted their inaugural symposium, in which speakers addressed a series of timely topics such as the possible forfeiture of personal privacy in relation to prosthetics and body modification, and the legal and societal tensions inherent in police body camera policies. In New York City, RethinkLinkNYC creatively raised privacy issues implicated by LinkNYC’s free public Wi-Fi kiosks and the system’s use policy, which incorporated welcome changes earlier this year partially responding to their and others’ concerns. The above examples are drawn from a list of many more successes for the EFA since 2016. If you’re working with a local organization concerned about the future of digital rights, we want to hear from you. And even if you’re not yet organizing locally, you’re welcome to join the next EFA teleconference to connect with the dozens of allied groups around the country who already are and learn from them. As we said a year ago, dissent and resistance grow only more meaningful in times of crisis. We are excited to support local efforts to inform, inspire, and mobilize communities to defend digital rights, bringing all of us closer to a society that honors civil liberties online.